Add a little style to your entertaining! 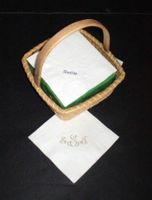 These lovely personalized cocktail napkins placed on your serving table will add your own unique style. Napkins that are approximately 5"x5". You can personalize it with a name in either block or script as shown or a phrase (depending upon size we may use 2 lines) such as "Merry Christmas" or "Happy Anniversary". Also perfect for Graduation, Baby Shower, Christening, Birthdays and cookouts. Zip Codes also add a fun touch for a summer cottage or ski house! Script and Circle Monograms also available. Recent Napkins Include: Cheers! and a Family Name, Class of 2014 (Grad Cap also available! ), Future Mrs. Collins, Welcome Baby Ricky, 02050, Vintage 1974, God Bless Kayla, Congrats! Mr. & Mrs. Collins, just to name a few examples!